My husband and I have always made a point to teach our kids to be brave, both physically and in character. When I was diagnosed at age 43 with Stage 2, Triple Negative Breast Cancer, it was my turn. I had my first mammogram at age 40. The radiologist didn’t particularly “like” the way in which an area in my left breast looked, but she wasn’t sure if this was just baseline for me. She offered a biopsy at that point, but I was so busy working and taking care of my family, including my mother who was struggling with cancer; I declined. I followed up with six-month diagnostic mammograms. There were no visible changes to the area and I was moved back to annual tests. In February 2014, my radiologist found an aggressive tumor in the same area she had been watching. It had grown to 2.7 centimeters in size. My mother had passed away ten months earlier, after receiving hospice in our home and my sons were still very young. I was treated at Penn, undergoing two lumpectomies, 8 chemo treatments and 6 weeks of radiation. I found great comfort in speaking with women who had gone through breast cancer. Although my friends and family were immensely supportive, I think it’s difficult to relate if you’ve never been seriously ill. Thankfully, I called the Delaware Breast Cancer Coalition. They found a peer mentor for me—a woman who was very similar in age and diagnosis. Now, I’m a DBCC peer mentor and I hope that I’m giving the women I work with the same hope that I received. The stress of cancer is unimaginable, however, after three years and being considered cancer-free; I absolutely know that I am a better person because of it. I work to live; not live to work. I am more fearless in my choices and truly understand how vulnerable we all are. I believe in taking a proactive approach to health. July 2007 I turned 40 and had a baseline mammogram. Four months later, I found a lump in my breast. Time stood still for me as I was told I had stage 2 ductal and lobular invasive carcinoma (ER+ PR+ and HER2+). Despite this news, I was confident I would be fine: my sister-in-law, Stacey, had successfully come through breast cancer 5 years before and we shared the same oncologist (Dr. Michael Guarino). Stacey was then, and is still now, my inspiration. A young wife and mother of two boys (7 & 9 years old), I opted for a double mastectomy, 4 rounds of chemo, a year of Herceptin, and 5 years of Tamoxifen. The doctors, nurses, and staff at Helen Graham were all so thorough and caring and following treatment I saw my oncologist every 6 months for a few years, then annually each July and all seemed fine. Or so I thought. It was mid-October 2015 when I found a lump in my armpit and a very small lump near my collarbone. I immediately saw my GYN, had an ultrasound of both areas, and met with my breast surgeon where I was given devastating news — not only did I have breast cancer, but this time it was advanced stage IV metastatic breast cancer. There was involvement of my lymph nodes, bones, lung, and most severely affected was my liver. The cancer was aggressive, painful, and following the first round of treatment, the prognosis grim; by Thanksgiving week I was “actively dying” and under hospice care. Widowed since 2008, my boys and I were facing a horrible reality and bleak future. And then, inexplicably, I began to improve. I am no longer on hospice, am still under treatment, and as long as it is effective, will likely be for the rest of my life. I am living with cancer, not dying of cancer and I cherish every single day, and the time I have with my boys and those most important to me. I believe in my heart it was through the steadfast support of family, remarkable friends, innumerable prayers, and the doctors, staff, and care I received at Helen Graham that I am here today to tell my story. Therein lies what WAS extraordinary about my experience: the proverbial wide and far-reaching blanket my family and friends wrapped me in once word spread of my diagnosis. Instantly, my family and I were fed, both physically and spiritually. Friends, relatives and colleagues made us food, cut our grass, sat with me during chemo, introduced me to yoga, sent me orchids, knitted me hats, traveled long distances to share a glass of wine, offered prayers, kept me laughing and positively cheered my survival into a reality. And for that I am extraordinarily grateful. In December 2015, just one month before my annual mammogram, I identified a lump in my right breast. For more than 30 years, under the care of Dr. Virginia B. Clemmer, I had regularly scheduled mammograms so I had been diligent about caring for my health. A breast exam, mammogram, ultra sound and biopsy revealed I had Stage 2 breast cancer. I remained calm and discussed my options before contacting my daughter. We decided to get a second opinion which helped in deciding on a plan of treatment. The plan was to have a lumpectomy followed by a cancer blocking drug and radiation. The most difficult part of the treatment has been trying to adjust to the proper drug to fight the cancer. The side effect has been a skin rash which is being treated by a dermatologist. What a small price to pay to FIGHT THIS DREADED DISEASE. I have maintained a positive attitude, a healthy diet (which included plenty of fruits and vegetables) and regular physical and mental activities. My faith in God has sustained me throughout my journey. Regular follow up exams and cancer screening tests with the medical team has contributed to my progress. My daughter continues to monitor, support and accompany me on important doctor appointments. She has been an integral part of my care team. My experience during these last few years has made me realize how truly fortunate I am for all of God’s blessings. It has helped me to know and appreciate God’s love on a different level. I am more grateful for and appreciate how precious life is and for the people in my life who love and care for me . . . my family, church family, extended family and friends. I realize there are many in the world who are not as blessed. 2013 was shaping up to be the best year of my career. As the Sr. Director of Therapy at Nemours, duPont Hospital for Children I had successfully opened three new therapy locations within the tristate area and been awarded both Manager of the Year and the Lenard Barry Service Excellence award by the hospital. Suddenly in November that all came to a standstill when I received a diagnosis of Stage 2B Breast Cancer. I had lost my Aunt to Breast Cancer within 18 months after her diagnosis, and even though I was watched vigilantly for years, with frequent mammograms and ultrasounds this still seemed to have come out of nowhere. My husband, family, friends, and co-workers got me thru this health crisis, which was the biggest fight of my life. I am thankful every day to have my health. It has been three years and I remain cancer free! Cancer changes your life, but it does not define who you are. Despite thinking about cancer every day, I appreciate all the positives I have decided to take from this change, not only for myself but also for those who touch my life. Each day I wake up with a renewed appreciation for life, family and the bonds I have made with other survivors, which has been a blessing found in having this hideous disease. In addition to co-leading team BRAVES for the annual Breast Cancer Walk, I started an Associate Cancer Support group at Nemours. The group is for any associate who has had a cancer diagnosis or is currently battling the disease. Our goal is to provide support, encouragement and education. When not busy with my responsibilities at work, I go to my “Happy Place” of Rock Hall, MD. to enjoy the Eastern Shore with my husband and family. All Photos were shot on location at The Gables at Chadds Ford. This beautiful restaurant is located at 423 Baltimore Pike, Chadds Ford, PA. The Gables is not only beautiful, but the food is out of this world. To book a reservation or to find out more about their many venues, contact them at 610-388-7700 or visit them at www.thegablesatchaddsford.com. They are open for Lunch Tuesday – Saturday, Brunch on Sunday, Dinner: Tuesday – Sunday. For complete hours of operation visit their website. 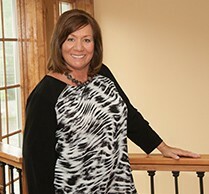 The Gables at Chadds Ford, established in 1997 and owned by Ann and Dan Kolenick since 2011, is situated in the heart of the historic Brandywine Valley. Located in a converted 1800s dairy barn, the setting is simple. yet elegant. The menu offers a contemporary twist on traditional American cuisine, utilizing French influences and even a touch of Southern flair! The Gables at Chadds Ford combines an upbeat and comfortable ambiance with a creative and well-executed menu. The result is one you will want to keep a secret, but you will not be able to resist sharing with a friend. 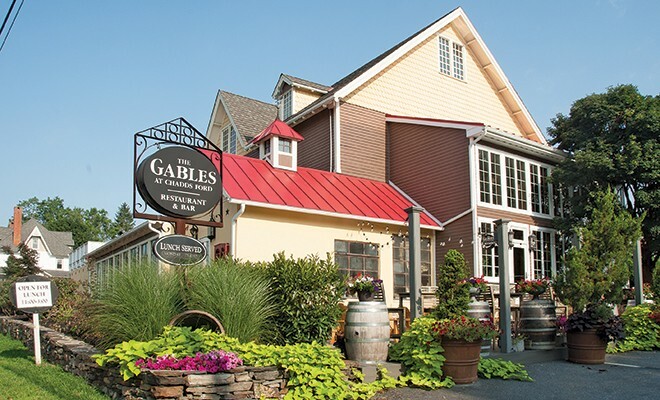 We would like to thank The Gables at Chadds Ford, located 423 Baltimore Pike, Chadds Ford, PA 19317 for hosting our profile photoshoot for our Breast Cancer Survivor Issue for the Women’s Journal. Thank you Ann Kolinick for allowing us to once again have full use of such a beautiful location. This is certainly not the first time that I have used The Gables, and I hope that it will not be the last. If you are thinking of hosting an event somewhere, I can say this is definitely one of my very top choices. To book a reservation for dinner or an event call 610-388-7700, or for more information on this great venue, where the food, drinks and ambience are out of this world, go to www.thegablesatchaddsford.com. I would also like to thank Lori Czarnota, Owner of Fusion Salon, and her wonderful team of stylists and make-up artists for providing hair and make-up for our shoot. What a wonderful group of professionals to work with. Fusion Salon is located at 3444 Naamans Road, Wilmington, DE 19810. 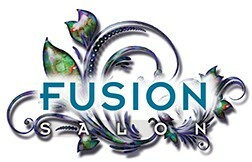 To book an appointment or to just find out more about Fusion call 302-479-9444, or visit them at www.fusionsalonde.com. dzphotography@comcast.net, go to www.debrazeccolaphotography.com or call 302-239-7193/ 302-540-5800. 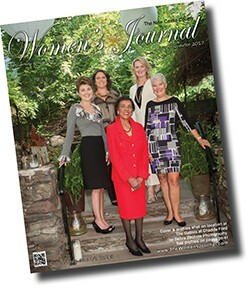 We were honored to have 5 beautiful women participate in our 4th quarter photoshoot, and I hope that you will let them know that you read their profiles in the Women’s Journal, and how much you appreciate that they shared their stories with us. Complete profiles on each of the participants are on Pages 39-41.